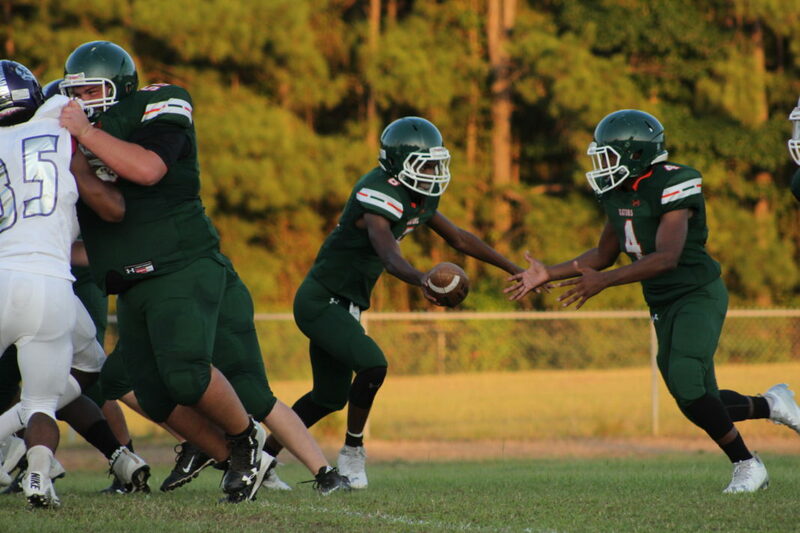 Quarterback Demondre Young hands off to JeMarcus Jackson while Dillon Longino blocks. Although Friday night’s week two game match-up for Lakeview did not come with a win, it was a victory for the team. They battled all night against Logansport who eventually took the win 0-42. Lakeview High School has competed against 1A powerhouse, Logansport for many years. Over the past few years Logansport has grown and last year they received the state title in their division. This was a challenge for the Gators but they were prepared to face it head on. “Our motto for this game was ‘Keep fighting’ and that’s what they did,” said Lakeview’s head coach Byron Keller. Demondre Young was key to the Gators starting at Quarterback for them and did a good job going 3-for-5 passing for 19 yards while also rushing for 24 yards. Marcus Sowell had 28 yards rushing for the Gators and averaged 21 yards per kickoff return. “Dillon Longino too; he was in every snap on offense and defense except the last series of the game. He kept the kids motivated on the field and on the sidelines,” said Keller. The Gators may have fallen 42-0 to the reigning 1A state champs, but they showed more pride and aggression then before. The Gators will need to keep the momentum going when they travel to Montgomery Friday, Sept. 15 for week three match-up. For a game preview see the Natchitoches Times’ Thursday edition Sept. 14.